There is no doubt that rappelling is the most dangerous thing that we regularly do in this sport. There are more climber injuries and fatalities from mistakes rappelling than from any other place in all of climbing. However, there are some things that every climber can do to make rappelling safer. First, if it is possible to safely walk off from the top of a climb, simply walk off. Limiting the amount of time that you spend rappelling is a surefire way to limit the amount of exposure that you have to potential mistakes. Second, climbers should always try to tie off the ends of their ropes in order to close the system. This is a simple thing to do that is often overlooked. Some climbers are afraid that their ropes will get stuck after they throw them...which is a legitimate fear. Closing the system should be a default tactic. But if there are extenuating circumstances, then perhaps the system should be intentionally left open. People seldom think about tying knots in the end of the rope in single pitch terrain, but ironically, that's where most people accidentally rappel off of a single end of the rope. All that it takes is a minor rope offset to ruin your day. Knots in the rope will keep such a thing from being anything more than another minor element to fix. And third, climbers should use some kind of rappel backup. Note the autoblock coming off the climber's legloop. Most people will put their hand on the autoblock hitch while rappelling. Rappelling with a friction hitch above the device has gone a bit out of fashion. One advantage to rappelling with a prussik hitch above is that it is easy to switch a rappel system into a rope ascending system. The prussik is already attached to the climber's belay loop, so all that he has to do is to add a second friction hitch for his feet below the first friction hitch. Most climbers now rappel with a friction hitch (usually an autoblock hitch) below the device, attached to a leg loop. This allows both hands to hold the rope below the device which provides for more redundancy in the rappel. A friction hitch works well below the device...most of the time. It is, however, imperative that climbers who employ this technique be extremely careful. 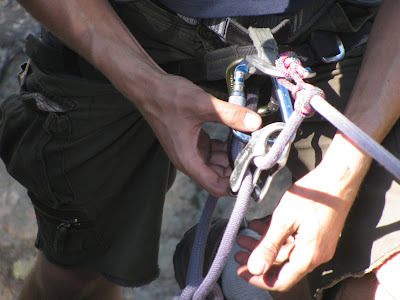 If a climber elects to hang from the rope by nothing more than his device and a friction hitch, it is possible that the hitch could be disengaged if it touches the device. Such a thing would result in catastrophic failure. This usually happens when one twists his body away from the friction hitch. If a climber needs to mess around with ropes or something else while hanging from a device and a hitch, he should definitely put a catastrophe knot in below the hitch. This will ensure that should something happen, the climber will not fall to the ground. Pretty unsound round up Jason, you've missed out the simplest way of safeguarding the autobloc, just use a screwgate crab - not failsafe but pretty secure. If you haven't got a screwgate or other locking crab just use snappers in opposition. Another thing I've got issue with is the use of a snap gate crab with such a short prussik loop. The illustration looks like a recipe for death. Loading the illustrated setup will almost certainly lead to a potential for unhitching. Surely the AAC can do better than this! The autoblock is a backup. In AMGA rock and alpine exams they currently don't require guides to have a locking carabiner on a backup autoblock loop. My understanding is that this topic has come up repeatedly at the AMGA technical committee meetings, but that they have never come to a consensus that it needs to be anything other than a non-locker. Certainly, if you have an extra locker (or opposite and opposed non-lockers) and it makes you feel more comfortable to use it, then by all means, please use it. A person's life should never be placed directly on a non-locker. The illustrations shown in the article don't present a situation where an individual's life is directly on a friction hitch. Friction hitches in rappelling situations should always be considered backups and nothing more. As to your second comment, the photo of the short prussik loop above the device was actually taken by the former technical director of the American Mountain Guides Association. This is the individual who decides (with the help of the International Federation of Mountain Guides) what techniques are acceptable in American Guiding. This particular use of a non-locker in another situation where a person's life is not solely dependent on the friction hitch, is considered acceptable. We can all do better by employing the simple technique of tying knots in the end of the rope and backing up rappels with friction hitches! A litany of cautionary tales if there ever was one and a common fatal mistake is exactly what Jason mentions: Not tying a knot at the end of the rope. What about using a petzl shunt above the repel device.